We spent a day in Carcassonne visiting the medieval city within the castle walls and a market outside, but eventually decided to get dinner in Toulouse, a 40-minute drive away. It was there, in the pink city, that our quest for cassoulet really began. We asked around for recommendations and were told to go to La Cave au Cassoulet near the Garonne River, apparently the most well-known traditional kitchen in the city center. We found it fully booked for the entire night and wandered the winding side streets around it until coming across what seemed to both of us the perfect little restaurant. It was called La Mare aux Canards. We took a moment to appreciate the duck-dominant menu, which offered a relatively modest list of Toulousienne classics: foie and terrine of duck, magret of duck, cassoulet with duck, things with Armagnac and prunes. There were actually only two non-duck beef options on the list of entrées (both sounded tasty) and only three fish dishes for the inevitable vegetarian. A strong sign that the kitchen was keeping things real. The atmosphere was exactly what our homesick souls had been craving. The warm glow of a fireplace beckoned us into the dining room, which was locked in red brick. Hand-painted, grandma’s house china was carefully lain on sturdy wooden tables; a proper set of silverware surrounding each plate. My boyfriend snickered silently at the antiquity of a far-too-large dessert spoon sat above his bowl. We picked up the menu full of expectation. 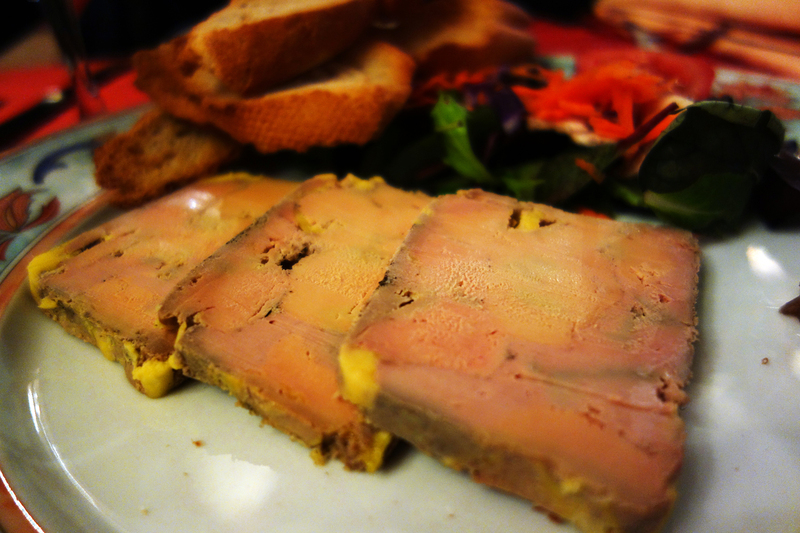 It doesn’t make too much sense not to order foie in Toulouse so we opted to try some. Three velveteen slabs of fattened duck liver arrived on a plate with a modest mound of caramelized onion and toast to smear it over. As the slabs had been sliced fresh from a chilled block of foie they were still a bit stiff and crumbly when they got to the table. But they soon melted into smooth liver butter in the toasty warmth of the dining room and as heat loosened the dense pâté it also unlocked the subtle grassy and mineral flavors of the liver. With time the patches of golden fat framing the slices also melted, contributing tremendous flavor and a luxurious creamy texture to each bite. 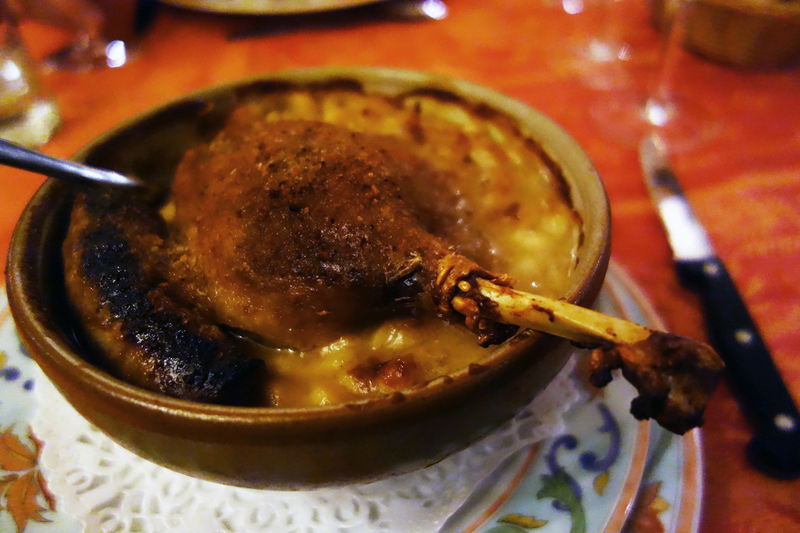 Cassoulet was the obvious choice at La Mare aux Canard. 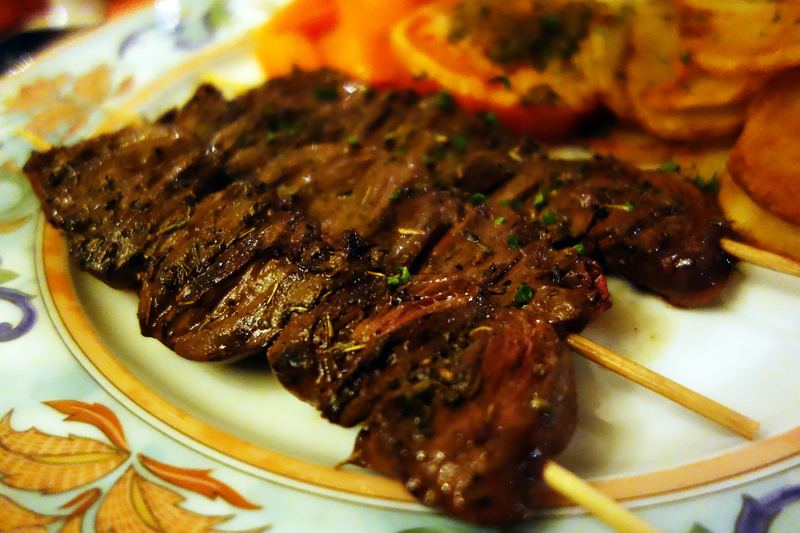 Brochettes de Coeurs de Canard perhaps were not, but we ordered them anyway. 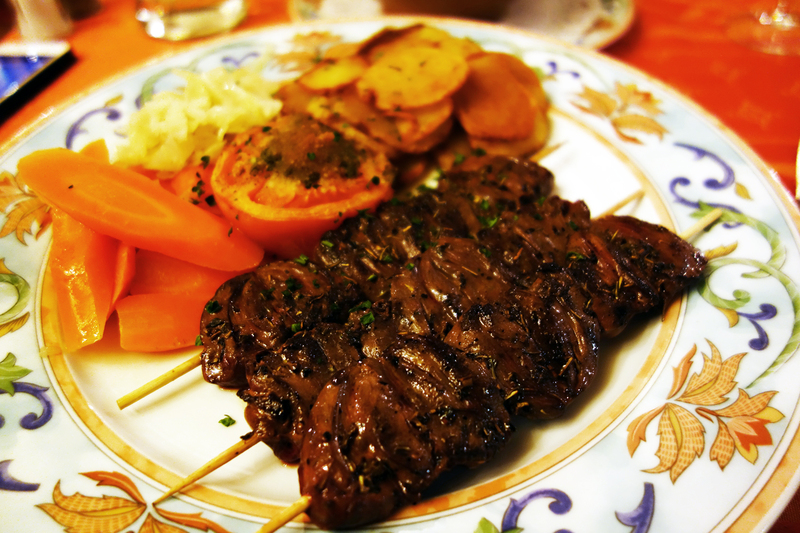 Nine duck hearts came sliced open and pierced onto skewers, grilled and seasoned with fragrant dry herbs, most notably oregano and thyme. On the side were some roasted potatoes, carrots and tomato, though we agreed that the veg was largely unnecessary. I believe we were also on the same page in expecting the hearts to be chewy, perhaps even grainy, with that pungent and metallic flavor typical of offal. Actually, the lumps of duck ticker were shockingly tender, similar in texture to a kind of meaty wild mushroom. They were firm and elastic but not rubbery, with a pleasant smoothness from the bundles of parallel fibers. That slightly dirty, innards funk was only faintly there in the background; a generous rub of aromatic herbs balanced the musky, sweaty flavors of the heart. This was a wonderful dish to share, though a whole portion might prove too many duck hearts for a single individual. 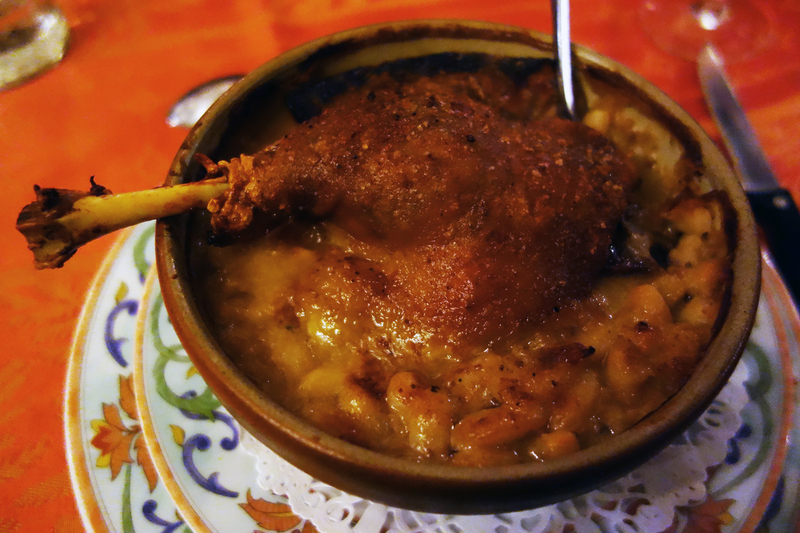 Cassoulet is a rich bean and meat stew cooked in an earthenware pot called a cassole. It is believed to have originated as a peasant dish in the the Languedoc region of Southern France. Legend has it that the stew was a result of the townspeople of Castelnaudary throwing their remaining meats and veg into a single cauldron to feed themselves during a lengthy siege of the town in the 14th century. Likely it can be traced back even further as the stew hints strongly at Arab influence, just like the bean and sausage dishes (e.g. : ollada and escuedella) of northern Catalonia. As with similar traditional comfort food classics, there are as many recipes for cassoulet as there are families and grandmothers in the region. However, three major versions exist, each one specific to a town within the Languedoc. 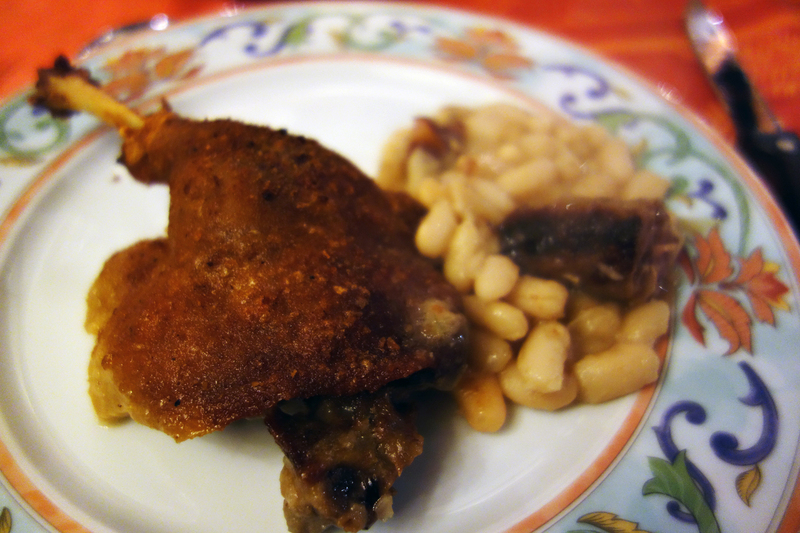 The cassoulet of Castelnaudary is said to be the most basic, yet strictest on the ingredients used. Only water from the town and produce from Lauragais can be used to prepare it. 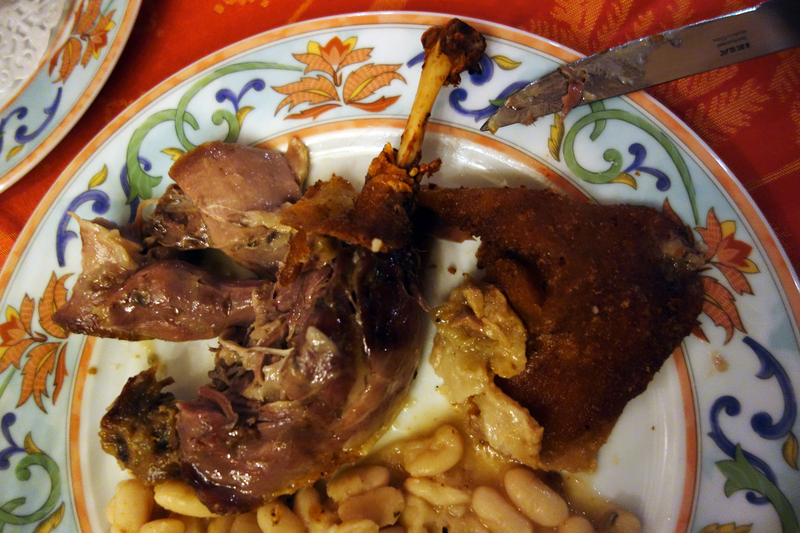 In Carcassonne they add partridge or shoulder of lamb. In Toulouse it’s made with bits of smokey pork skin and local pork sausage; it’s topped with a confit of either goose or duck. In the case of La Mare aux Canards, it’s duck. It’s duck in all its glory. 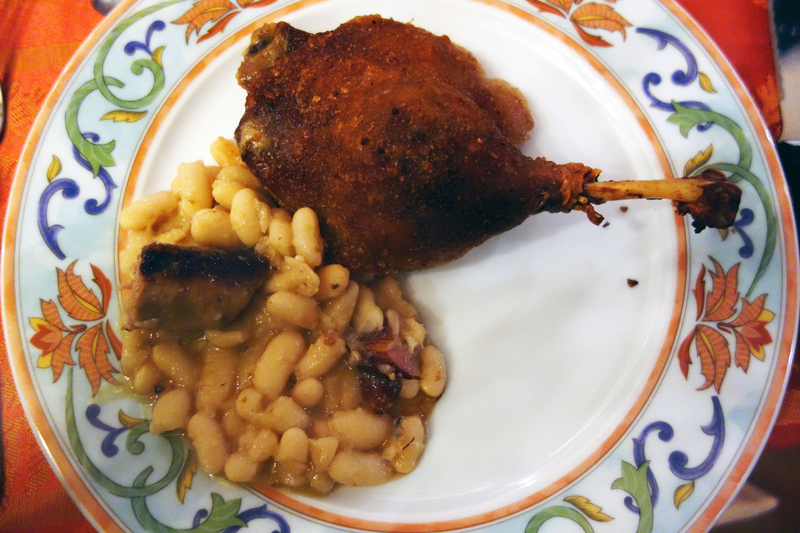 What I don’t for a moment hesitate to call a perfect confit duck leg adorns a bowl of steaming white haricot beans in their own luscious, starchy cooking jus. A single sautéed and crisped up Toulouse pork sausage is also lain over the top. What first seems an odd combination of proteins makes sense after I bow my face over the surface of the bowl. There’s smoky pork and thyme and garlic at the basis of everything. There’s a combination of very distinct textures. The beans are cooked to that wonderful consistency; although still firm and round, the skin begins to loosen, turning almost sandy-soft and pouring forth its natural starch to thicken the cooking liquid into a velvety, viscous bean-gravy. This liquid canvas picks up the smoky, salty flavors of the pork skin and fat back that are suspended in the stew, extending that heavenly porcine essence across the entire dish. The soft, warm beans are immensely comforting even on their own. They caress the soul in a way similar, as my boyfriend pointed out, to how lentil stew with smokey ham hock can do. And then there’s the little saucisson, a modest pork sausage relatively mild in flavor save for garlic and white wine with which it is seasoned. The ground pork inside has a slightly sweet, clean taste to it and balances but does not get lost in the smoked pork flavor of the stew it is bathed in. The link has a thin layer of tight, snappy skin that is slightly charred to a crisp. The interior is crumbly though not dry, hydrated by the creamy base of the stew and by the steam wafting off the beans. Finally, there’s the duck. It’s roasted to the point where slivers of flesh slide off the bone with a single gentle tug. The meat itself is succulent and juicy, cooked in and hydrated by its own precious fat. The flavor is deep, only slightly gamey and boosted with a thyme and garlic marinade. And over the surface of the thigh is the single most sensuous element of the dish: the duck’s crackling skin made even crispier by the grainy, golden brown bread crumb layer that covers it. The coarse exterior of this coat feels rough against the tongue, contrasting the slippery, smooth duck skin on the opposite side. Following his instructions I pulled this crunchy, wonderful blanket off the meat and cut pieces of it to enjoy separately, on its own. Within a pot of cassoulet these ingredients come together; the result is greater than the sum of parts. Duck, pork and thick, wet bean harmonize wonderfully, creating a majestic mélange of textures and flavors that lull the palate into a pleasant daze. 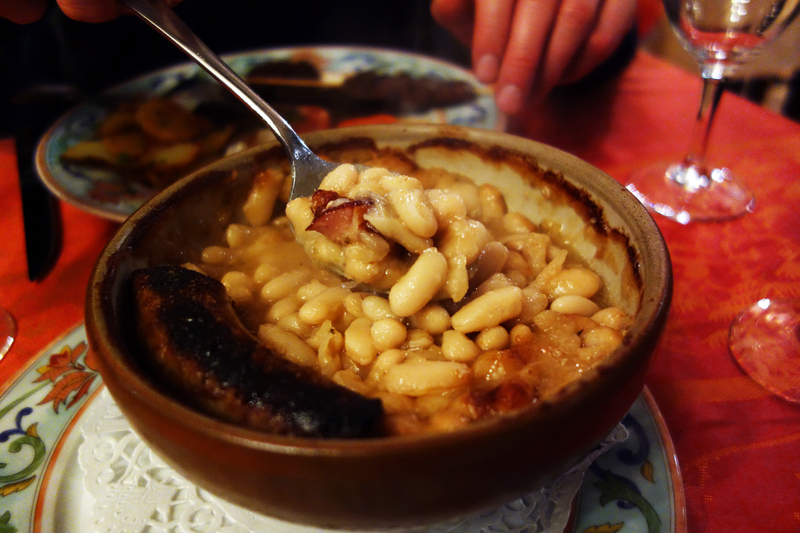 On a chilly night in Toulouse a bowl of homemade cassoulet warms both the body and the soul. 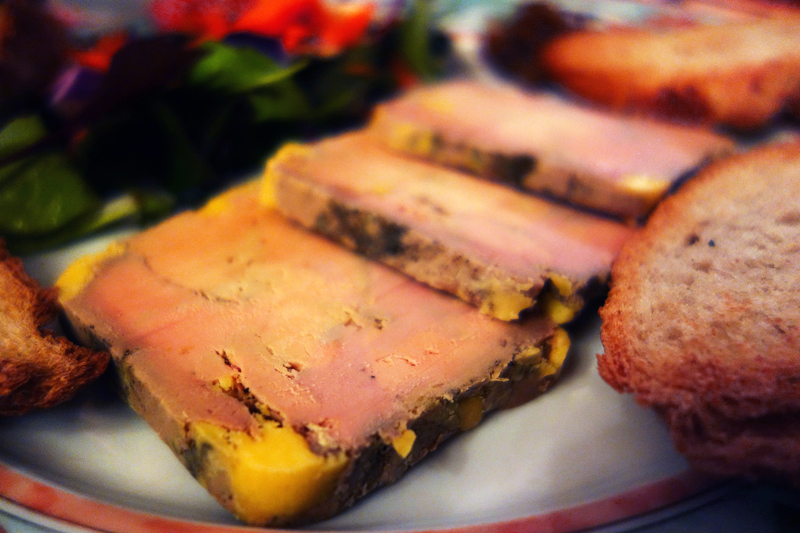 La Mare aux Canards was the perfect place to enjoy this iconic dish. A cozy restaurant we found on our own, independently of recommendations or online reviews. A place I am certain we will visit again one day. March 29, 2016 in FRANCE.